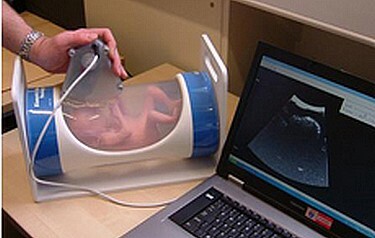 The handheld USB device — roughly the size of a computer mouse — works like existing ultrasound scanners, using pulses of high frequency sound to build up a picture of the unborn child on the computer screen. Tested by experts in the Regional Medical Physics Department at the Freeman Hospital, part of the Newcastle upon Tyne Hospitals NHS Foundation Trust, the scanner produces an output power that is 10–100 times lower than conventional hospital ultrasounds. The engineers hope the device will be used to provide medical teams working in the world’s poorest nations with basic before-birth information that could save the lives of hundreds of thousands of women and children. “Imaging to obtain even the simplest information such as the child’s position in the womb or how it is developing is simply not available to women in many parts of the world. Neasham said the original aim had been to make something portable and easy to use that would be affordable in developing countries as well as for some applications in the UK where ultrasound is still considered cost prohibitive. An expert in underwater sonar technology, Neasham has developed systems for imaging the seabed — looking for ship wrecks or specific geographical features — as well as underwater communications and tracking systems. Drawing on his expertise in sonar signal processing, the design keeps components and hardware costs to an absolute minimum, and works by manually sweeping a transducer over the skin while a focused image is formed by the PC software. Funded through an Engineering and Physical Sciences Research Council (EPSRC) Knowledge Transfer Account (KTA) and a Proof of Concept loan from NorthStar Ventures, the scanner requires nothing more than a computer with a USB port. Neasham said the beauty of this device was that it would complement — rather than replace — the high performance scanners available in hospitals. “It was my own experience of becoming a father and going through the whole antenatal process that prompted me to start the project,” explains the father-of-two. UN statistics estimate more than 250,000 women die annually from complications during pregnancy or childbirth, almost all of them — 99 per cent — in developing countries. Tragically, most of these deaths are avoidable and a lack of access to equipment is cited as one of the key factors.